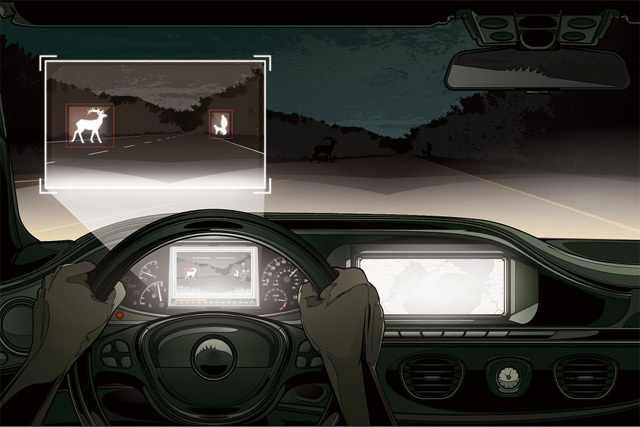 The in-car night-vision systems are around for the last 13 years, they can easily identify pedestrians approaching a roadway, probably they have made driving safer up to some extent. But they still have a pretty big blind spot: animals. Each year, drivers alone int the U.S. strike about a million deer, causing 27,000 human injuries and $3.5 billion in damage. Fortunatly someone has presented a solution, a Swedish safety-system company Auto­liv and Mercedes-Benz will roll out Night View Assist Plus on the 2014 S-Class. This system not only identifies human beings but also picks out cows, moose, horses, deer, camels, and even wild boar. The reason why it tool so long to upgrade the system just from humans to animals is that recognizing animals is much more difficult than recognizing people. Species vary widely in size and shape, have profiles that change drastically when they turn, and move differently. Human beings in comparison, have more or less the same shape and move in the same way. To train the system, Autoliv cataloged thousands of animals across five continents. The night View Assist Plus merges data from two cameras to create an illuminated view of what’s ahead. When an animal or pedestrian nears a roadway, the system highlights it on an in-dash display, and, if danger is imminent, sounds an alarm and pre-charges the car’s brakes. There’s one feature U.S. regulators have yet to approve, though: In the European version, a spotlight shines a tracking beam onto live obstacles in the road, making them almost impossible to miss.